The Infamous Stringdusters have been touring almost nonstop since the start of 2017, and they've put out a live album documenting performances of songs on their latest album of original material, "Laws of Gravity." But Dobro player Andy Hall feels the group's current live show is plenty fresh — even for fans who've seen the Infamous Stringdusters over the past year. "I feel like this past year we've made sort of a large leap in our live show," Hall says. "We've always liked the improvised jamming element of our show, but we kind of consciously took it to this next level this (past) year, where we're stringing three or four songs together at a time without a break in the music through improvised sections and jams. 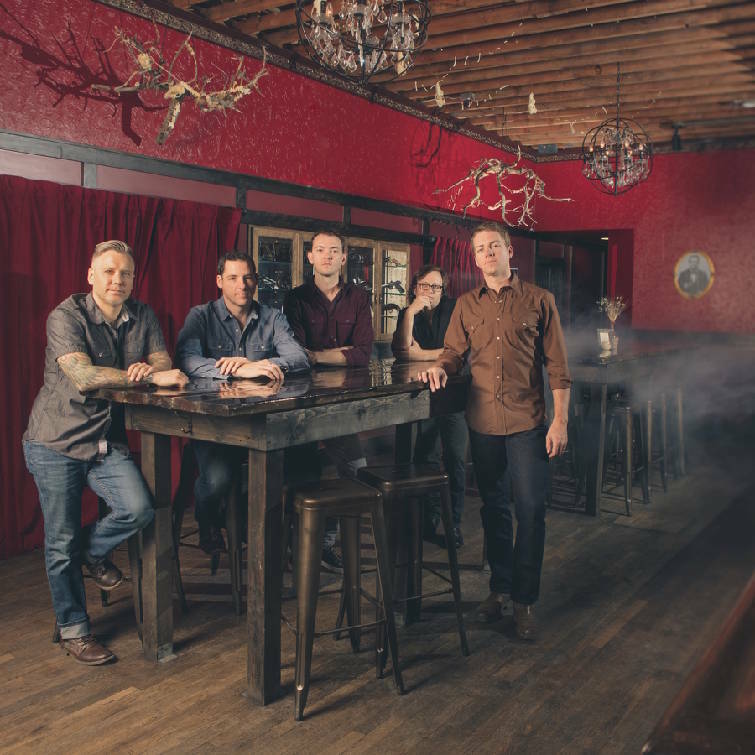 Infamous Stringdusters play the 3 Sisters Music Festival at 9:30 p.m. on Friday, Oct. 5. "So now, it's a little less like play a song, stop, talk to the audience, play a song, stop, talk to the audience. It's like these longer sections of music that weave through songs, choruses, solos and group improvised sections. So there may be 20 minutes of music before there's a break. "That takes learning techniques and skills that will allow you to do that," Hall said. "I feel like it's changed our show a lot." The growth in the live show is just the latest part of what is making the "Laws of Gravity" cycle a landmark period for the Infamous Stringdusters, which includes Hall, fiddle player Jeremy Garrett, bassist Travis Book, guitarist Andy Falco and banjo player Chris Pandolfi. The album finds the group re-embracing their bluegrass roots, particularly on songs like "Freedom," "Black Elk" and "A Hard Life Makes a Good Song." "Laws of Gravity" was named co-winner of the Grammy Award for Best Bluegrass Album with Rhonda Vincent's "All The Rage — Volume 1." Hall considers the Grammy perhaps the biggest honor his group has earned. "It's known as the biggest award in music," he said. "I mean, there are smaller organizations that are awesome. For us, we've been part of the International Bluegrass Music Association for years. And back 10 years ago, we received some awards from them. That's awesome because that's getting recognized by your peers that are in that genre. But the Grammys, it's all of music. You're recognized sort of in a broader sense. So yeah, it's really exciting." As touring continues this fall, the band is also working on the launch of its new record label, Tape Time Records. Hall said in today's environment, labels don't offer better distribution than a band can arrange or funding to make albums. "It's sort of like, OK, if we can get the distribution and they're not going to give us any money to make a record, why would we do that (sign with a label)?" Hall explains. But there's another goal for the label: It's a way to bring bands together and create a sense of community. "The bigger part of the reason we started this is because in some ways, the jam grass scene, if you will, is kind of a disparate, fractured thing. Everybody's kind of just doing their own thing," he said. "There's no central place that the art all happens So we want to start basically making ways to team up, to pool our resources, to pool our energies and have it be something that artistically can be real interesting. "Maybe it means there will be more collaboration (between bands). Maybe we'll be able to write with some of these artists and get these records released, or guest on each other's records or make a compilation, just sort of make one centralized location where some of this stuff can all live together and create together. That's the exciting part."